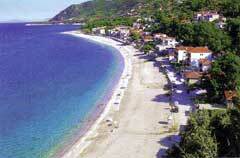 In the north of Pelion lies the summer bathing resort Agios Ioannis. It can be reaches through the mountain route of Ano Volos, Portaria, Hania. Agios Ioannis (Saint John) is one of the best touristic centers of the country, crowded in the summer. It has a large sandy beach with pine-trees that reach till the sea. A small river, near this group of houses, makes the landscape look even more beautiful. It is 57 km northeast of Volos. The place has also a small fishing port.